Hilton London Kensington has unveiled its new-look meetings and event spaces, following a full refurbishment. Taking inspiration from London’s parks, including nearby Hyde Park, the hotel has undergone a complete makeover of its ten conference rooms. Encompassing the theme of a ‘walk in the park’, the refurbished rooms offer guests a sophisticated and tranquil setting in which to work and relax. The design uses a warm colour palette with accents of colour, incorporating lightly mottled shades and layered patterns for a rural meets urban, eclectic city feel. In keeping with the naturalistic theme, the flooring embodies the lakes and flowers of London’s parks, with the carpets providing a tapestry of fauna in colours unique to each room. Wall sconces add detail to the décor, while Italian droplet chandeliers, featuring copper-coloured Murano glass flowers add a touch of sparkle, echoing the glistening effect of water. Splashes of colour are offset against formal elegance, with wood panelling completing the look and acoustic soundproof panes enhancing the event experience. 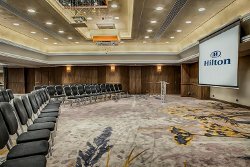 Hilton London Kensington offers ten distinct conference and event spaces, ranging from two intimate boardrooms for meetings of up to twelve delegates, to the spacious Christie Suite, which can accommodate up to 300 people banqueting style. Other rooms include the Christie Room, which has a 200 person capacity, and the Kensington Suite, which can accommodate 100 people, theatre style. A stone’s throw from Shepherd’s Bush overground and underground stations and just 30 minutes from Heathrow Airport, Hilton London Kensington offers convenient transport links to the rest of London and out to surrounding regions. Nearby attractions also include Hyde Park, The Royal Albert Hall, Kew Gardens and the Victoria and Albert Museum. For more information or to book, please visit www.hilton.com/kensington or call +44 203 0022436.